The 4X Lab is a next generation software that massively helps professional traders take full control on chart, alerts and orders. Control your trading intuitively, easily and precisely. Place orders using four unique methods, all in accordance with Risk Management, all doesn't require specific skills. Are you confused by Expert Advisor panels occupying half size of the chart? A lot of unwanted information? Too much information on the chart can cause sensory overload. When you suffer from sensory overload, you miss other important visual warnings! With the 4X Lab, you can place and manage orders easily and intuitively using its many unique features. All in accordance with the rule of a minimum on the chart, maximum performance. The 4X Lab accelerates and facilitates managing many orders, also with common levels of SL and TP, in this way increasing trading productivity. 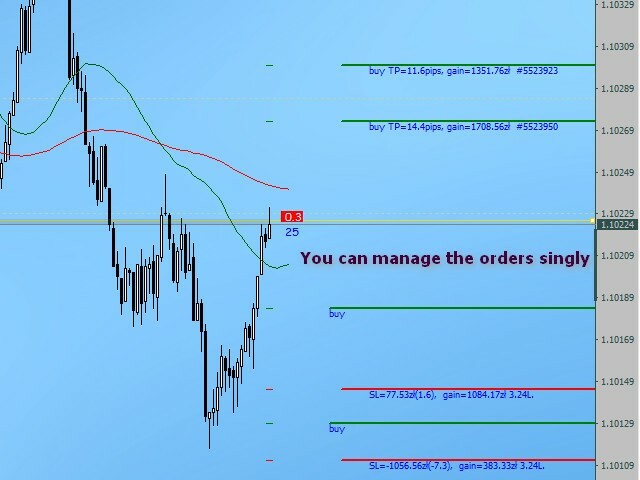 Risk management by the 4X Lab when placing the orders prevents you from risky trading! Alerts with 70 different sounds according to alert type and currency symbol ensure perfect orientation between charts. Alerts for upper/lower breach of the price level and sound alerts for every trend line on the chart in range of the price. The 4X Lab also can work with your Trading Robot or Signal Provider, which by better managing of the orders can prevent you against risky trading. You can even disable placing SL and TP by your robot, then if robot is placing orders according to entry and exit rules the 4X Lab can manage the orders by placing SL, TP, sets BE, BE+(minimal profit or commission), TS, taking partial profits at BE or BE2, TP1, TP2, SL2 (e.g. for TS) or closing all opened orders on tops and bottoms using trend line CAOO. With 4X Lab, you can take profits partially by hotkeys Ctrl+1/2/3 or closing all market orders by hotkey Ctrl+4. 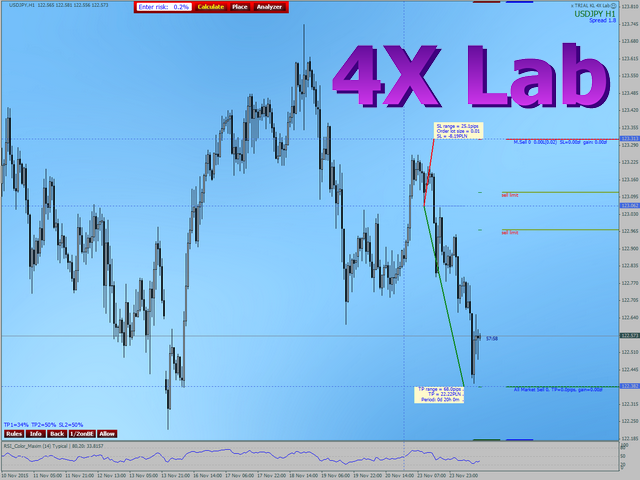 By 70 different sound alerts the 4X Lab can inform you about events on your charts. The 4X Lab is taking screenshots when the orders are closed, closed partially or deleted. All is kept in clear way without annoying order lines that overlap your analysis. Probably, I forgot about something. You can buy the product even for the price lower than one SL of the professional trader. Because the program is big, has a lot useful features and full description exceed 31000 characters in comparison to 3600 allowed here link to full description you will find on my profile. Sound files are not included and you can use your own sound files with proper name. If you leave 5 star review as free extras, you can get additional wallpapers and 70 files of sound alerts for most important currencies included silver and gold, different for upper, lower breach and trend line alert. Sample sounds and wallpapers with mark are available on my website. Leaving 5 star review, you motivate me to further develop this software and tailor it to your needs. Prefix KL before name '4X Lab' is added for search results of all my products. If you have any questions or suggestions, feel free to let me know. 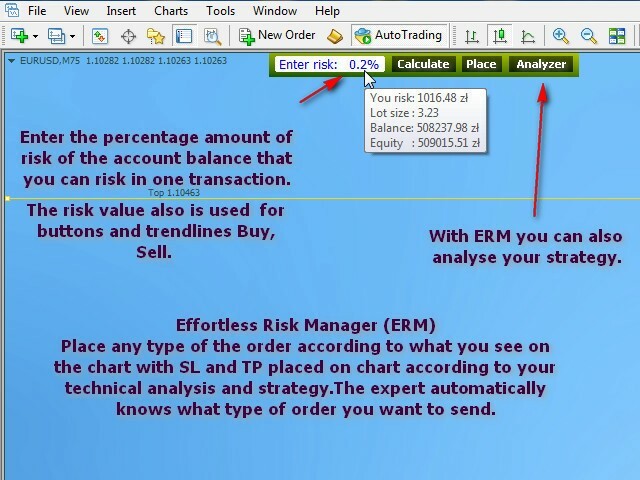 Added new pips calculator module due to broker can use different quotations for instruments on the same trade account. For indices like DAX30 some brokers are using two digits after comma, so then 1pip = 100points and on 5 digits forex symbol 1pip = 10 points. For major Forex symbols it is easy set pip value according amount of digits after coma and it is done in option "Calculate point value automatically". Also, in this option indices, which name start from "[" like [DAX30] (Admiral Markets – name that you can see on window title) are calculated as 1pip=100 points. Moreover, for proper calculations you can set another factor for instrument name starts from “#” like #BAS for BASF CFD. Typical values are 1 for 1 pip = 1 point, 10 for 1 pip = 10 points, 100 for 1 pip = 100 points. When you double click "Calculate point value automatically" you can select another option from the drop down list. Added new feature: trailing stop managed by standalone trend following indicator e.g. supper-trend. For this hold clicked SL line about 1sec. and edit TS box. 0 - means TS is disabled. bars - means TS will follow max/min of last 4 closed candles. trend - means TS follows according your indicator - you need set in settings proper indicator name without .ex4 and edit indicator parameters. When no orders on the chart then TS value is reset to default. Use indicator, you can also type trend as TS value on SL line. – false is recommended. Time frame of the indicator calculations, 0 means current. – you can set fixed period. Indicator input value 2. - each value as floating point value, e.g. 0.0 means default indicator value. Indicator input value 3. - each value as floating point value, e.g. Indicator input value 4. - each value as floating point value, e.g. Indicator input value 5. - each value as floating point value, e.g. Indicator index buffer for buy orders 0-7. – 0 means first buffer. 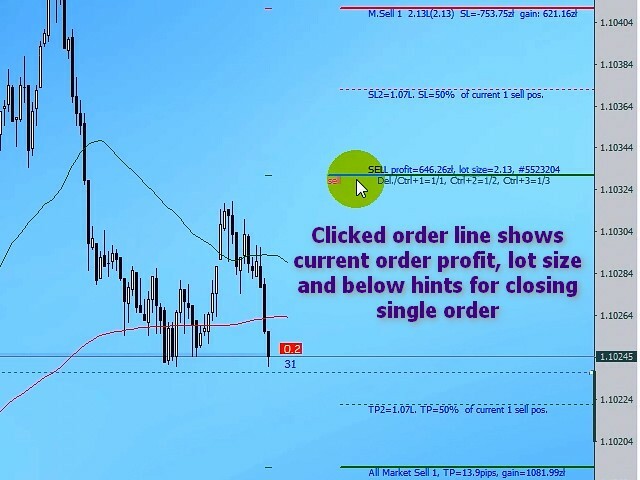 Indicator index buffer for sell orders 0-7. – 1 - if indicator uses one buffer type 0. Indicator shift. – shift of calculations. This feature is experimental and may needs to be restarted if you changed the indicator. Also it may not works with your indicator. Added new feature: you can automatically delete pending orders when price reach opposite horizontal line top or bottom and longer keeping pending orders is pointless. Feature can be used if the strategy fails or for price breakouts. Hold clicked alert line top or bottom about one sec. and click “Delete pending orders OFF”. After that, horizontal line bottom can delete all pending orders above the price. It means, that all buy stop and sell limit orders will be deleted, when price breach line bottom. If price breach line top, then all pending orders below the current price will be deleted. Please watch new videos about 4X Lab. - Removed software conflicts with new indicators Toolbox PRO1(2,3,4)(soon) and Andrews Pitchfork PRO. - Added default sounds (unknown symbol) for 'All Trend Line Alerts' module. - Fixed problem with deleting rectangle objects due to object name. - Added ATR to candle timer. - Improved communication between 4X Lab on PC and 4X Lab VPS. - In Effortless Risk Manager module added different font size for Analyzer mode, keyboard arrows can flip take profit label to the left or to the right. Arrows up and down reset this choice to automatic choice. Esc key removes last trade of Analyzer mode, also last step when trade is plotted on a chart or trade is drawing wrong. - Added proper calculations of the lot size for partial closing of the order if minimal (broker)lot step is 1 lot. This solves problem of partial closing on BE(1/2onBE), TP1, TP2, SL2, Ctrl+2(1/2) and Ctrl+3(1/3). For your information, keys Ctrl+1 (whole order), Ctrl+2(1/2) and Ctrl+3(1/3) are closing single order. Line of the order must be selected on chart by mouse pointer. Also, for partial closing the order must be divisible according to broker rules. Keyboard shortcut Ctrl+4 is closing all order buy and sell on current chart, in that case no order can be selected by the mouse pointer. 2. If no orders, then break even and trailing stop (additional menu on the SL line) should be reset to inputs. 1.Full version of 4X Lab cooperates with 4X Lab VPS on remote desktops as master EA. 2.Control panel on any Stop Loss line. Hold clicked left mouse button on stop loss line (about 1 sec.) and control trailing stop, break even, additional TP 1, additional TP2 and additional SL2 for partial trailing stop. Stop loss line can’t be moved because panel disappear. • Switch on/off break even (BE) or collective break even (BE2). • Set pip distance to price for trailing stop. If you type Bars your stop loss will follow price according to min. /max. of last 4 closed candles. If you type 0 value the trailing stop is disabled. • Enable partial take profit 1. • Enable partial take profit 2. • Enable partial stop loss 2 that is great for manual trailing stop. 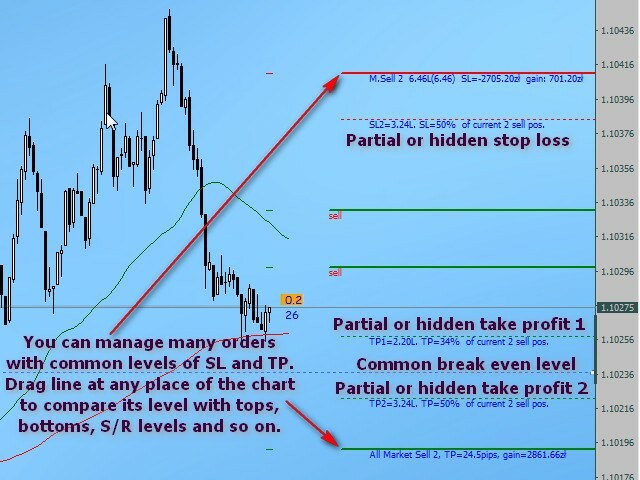 Percentage value of TP1, TP2 and SL2 you can edit in labels above buttons Info and Back, if 100% then can be used as hidden take profit or stop loss. 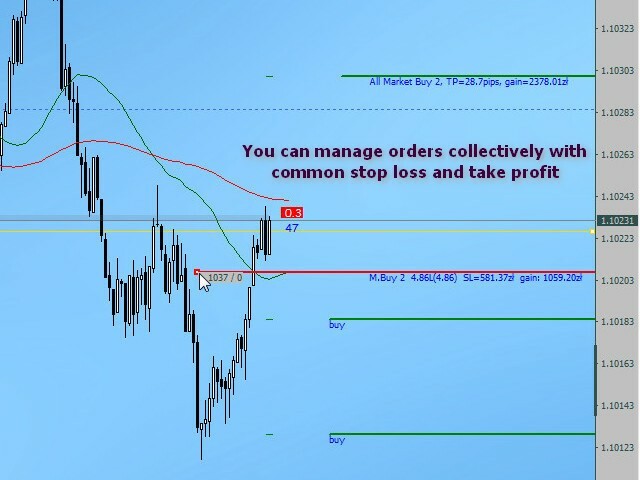 If all orders are closed or deleted then break even and trailing stop is again set according to Inputs. For proper pips calculations on CFD and indices you can choose how many points consists one pip. Added tips in German (Tips auf Deutsch) and Polish (Wskazówki po polsku) Languages. Hold mouse pointer and read a tip. As default tips are set in English language. Added possibility of closing orders on SL lines of 4X Lab if your broker uses minimal distance to price. In that case It allows you for a tight scalping. Fixed bug with the message box that disallowed to drop message box on any place on the chart. Unlimited sound files for audible alerts that provide you perfect orientation between charts. Now you can create sound file for any instrument like currency pair, indices, CFD and so on. The sound file name must be created according to those rules: alert prefix + first six characters of symbol name + file extension .wav. Prefix ‘t’ for trend line alerts, prefix ‘s’ for lower breach alerts, prefix ‘r’ for upper breach alerts. Important: only exact instrument name according to capital and small letters. If instrument name has more characters than six, the only first six characters. Fixed reported problem with auto-hiding (freezing), which I was not aware because I don't use free version. If you have old version then please upgrade it to current one. For key ‘P’ added automatic align screenshot to right if chart auto-scroll is enabled, else chart screenshot is centred, so you can take a screenshot from scrolled chart. 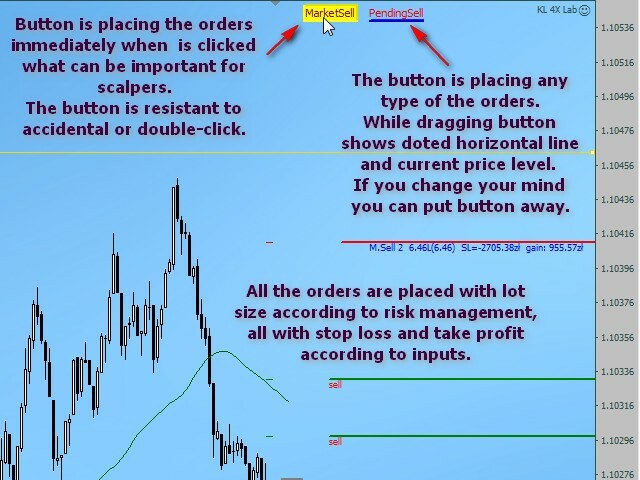 For key ‘D’- if mouse pointer position according to bars is bigger than amount of visible bars, then deleted lines Buy, Sell, Close will be recreated according to mouse pointer position. It solves problems of hiding lines especially on offline charts. Simply, scroll chart to the left and press key ‘D’, then lines are hidden. - In the settings, added Order Magic Number for analyzing trades with new indicator KL Account Performance Analyzer. - Added better information about product in button Info. - You can change the sounds of transaction to the standard sounds of MT4. - Added button Rules from full version. - Added list of hotkeys in button Rules.